“Hold this” says our guide. “You don’t have to do anything else. The dogs will just run. They follow the ones in front”. “If you want”. Audible guide snigger. “It doesn’t make any difference”. 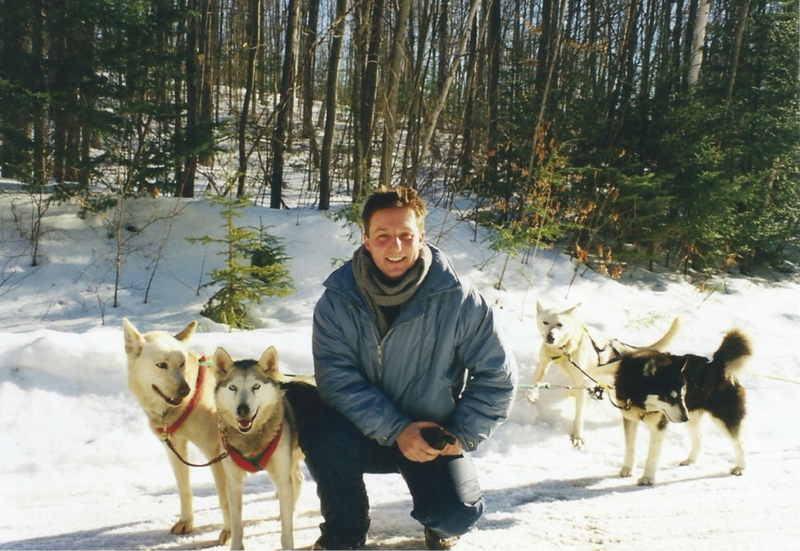 And that was Lesson 1 on my day out with a husky team in Ontario, Canada. 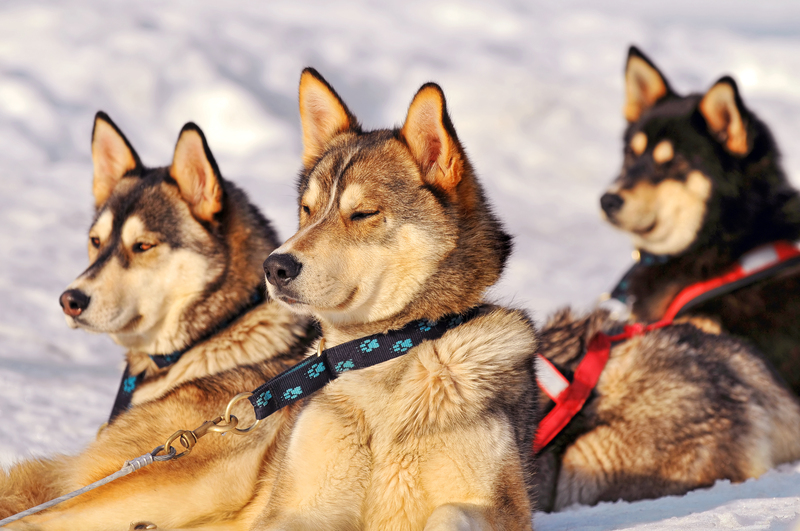 It’s a fantastic experience – one of life’s real thrills, running with (sort of) wolves – but here’s what they don’t tell you about sledding with a husky team. I did my homework, especially for the occasion, and learned that you shout ‘mush’ because it’s derived from the French ‘marcher’ (to go, to run). 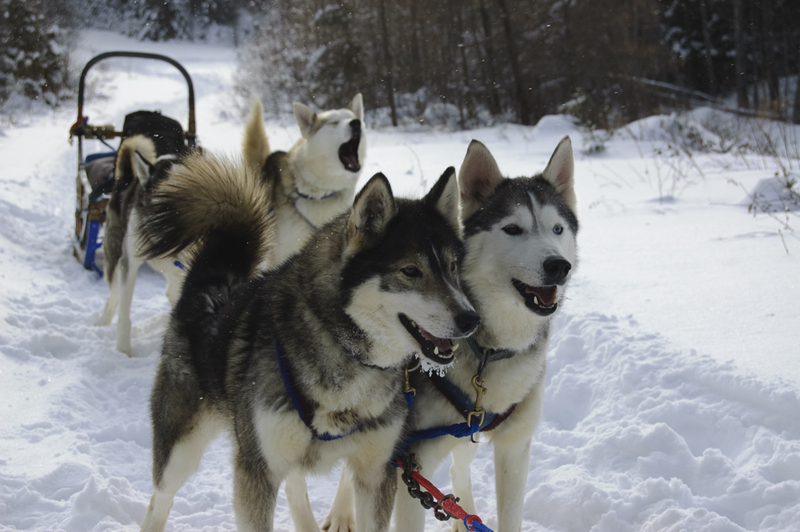 Surely they shout ‘mush!’ You’d think it would be enshrined in Canadian law to shout ‘mush’ at a team of huskies. But they don’t and it isn’t, which is obviously a huge disappointment – so just for fun you shout ‘mush’ yourself, which is kind of entertaining until you quickly realise that there’s all sorts of other stuff you really should be concentrating on. Huskies run really, really fast. . . I mean really fast. And while it’s one thing to watch a dog running fast and say”My, that pooch can move”, it’s entirely another to be at ground level behind several such pooches, being hauled along at the speed of light. So forget all about gaily shouting ‘mush’ while you amble across the tundra, enjoying the picturesque Canadian scenery, perhaps sipping from a warming mug of hot chocolate as you go. Clinging on is more the name of the game, plus quite a lot of shouting and swearing as pine trees, rocks and cliff edges swerve into your vision and then out again as you flash by. You’ve seen Terminator, right? Well, your huskies just follow the ones in front, and they keep on going at the same breakneck pace for ever, until you grow old and die, still on the sled. Huskies do stop running for two reasons though. One – if the dog team in front stops, yours stops too. (I have no idea how the very front team stops. I think it must be something to do with dog biscuits.) And two – they stop when you fall off. Note, that’s when, not if. You’re on a low-slung slidey sled, going at a zillion miles per hour, powered by zombie-dogs. And you’re rubbish at it. And the dogs only understand French. And you’ve confused them by shouting mush a lot. Of course you’re going to fall off. 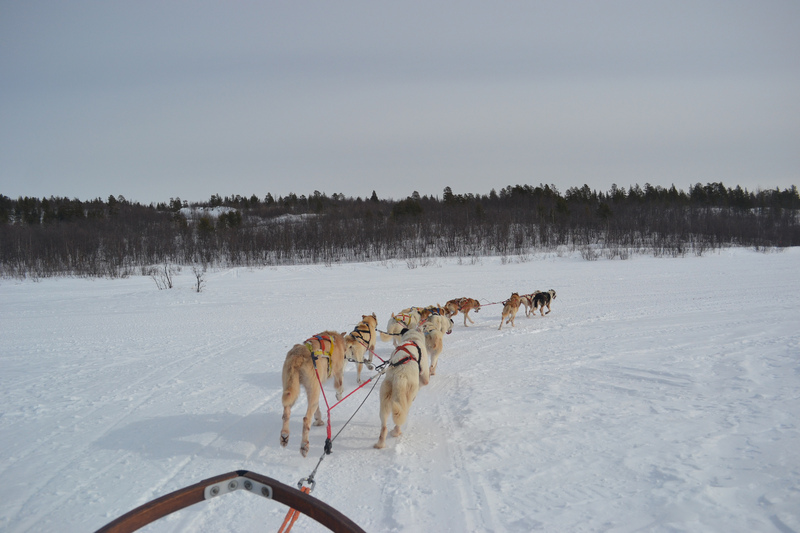 But amazingly, when you do, the dogs stop running straight away and you lie there under an upturned sled. But hang on, whatever you do . . .
Because then they just start running again, whether you’re balanced on properly or not. It’s a dog thing. Sled upturned – idiot human fallen off. One foot on sled – idiot human still not ready. Two feet on – idiot human good to go. Basically, you do a lot of falling off, getting half back on again, being dragged for a while through the glorious Canadian wilderness, and then falling off again. There’s lots of laughing. In French. At you. Suddenly you can see for miles. All the trees have disappeared and Canada opens up in front of you, in all its white-snow, blue-sky glory. It’s majestic, and even the huskies seem to be enjoying the view. No trees. That’s because you’re in the middle of a huge lake. A frozen lake, about half a mile deep. They don’t tell you that before you set off. They don’t ask if you’d rather go around Icy-Water-of-Doom Lake, they just run right across it. How shall I put this? Huskies are very busy, what with the running and all. They don’t have time for bathroom breaks, so they just go – and I’m talking Numbers One and Two – on the go, if you see what I mean. 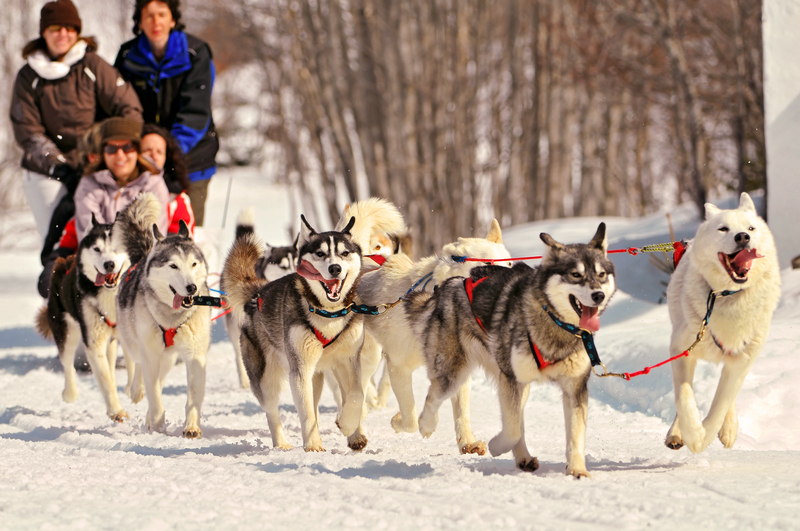 Now the sled is behind the huskies, and you’re being pulled along quite fast in their wake. To be fair, they do tell you this (everyone in Canada tells you this), but you don’t necessarily get to appreciate these things at the time. But after a couple of hours – when you realise that you haven’t fallen off for a bit, and that the lake ice held and, hello, was that an actual moose? – both huskies and Canada come together in glorious symbiosis. It’s blindingly obvious that this is the only way to see this extraordinary country, and you begin to muse on the possibility of getting your own husky team, just for weekends, or maybe even to take you to work, and after all, they’re hardly any trouble . . .
Then you fall off again. Lovely article. Always wanted to go sledging and hope I do some day. They really are a spectacular breed.